PLEASE CHECK: Wan (right) working out some details with Bong after visiting with supplies. KUCHING: The work of a welfare organisation is never done, but that does not stop those with a heart for the needy from trying their best. What began as a one-man project has now resulted in Hope Place, or ‘Persatuan Kebajikan Harapan Kuching ‘, a welfare group that is now helping 50 needy families. Registered earlier this year, Hope Place visits the poor and less fortunate families to contribute some essential food items like rice, cooking oil, Milo, sugar, biscuits and noodles once every two months, leaving two months worth of supplies. Many of these families or individuals barely earn enough to make ends meet, so the assistance of these basic necessities goes a long way for them. For the families with children with special needs, they are also provided with milk powder and diapers. During a courtesy call to The Borneo Post yesterday, Hope Place volunteer Kelvin Wan said that their target group is broken down into five parts – special needs (OKU) individuals with conditions like Down Syndrome, senior citizens who are sick or abandoned by their children, single mothers whose income is below RM500, those who are physically disabled and families with a total income of below RM500. “We visit to look at their living and family conditions. It is evaluated on a case by case basis,” said Wan. He revealed that Hope Place has five regular donors and many one-time donors who were moved by newspaper articles to make a donation. “Our recipients keep increasing but our donors are on and off,” Wan said, adding that they rely on publicity to keep the donations coming. Hope Place, which operated as Hope Kuching before being registered as a charitable body, tries to help out in other ways besides handing over food. They also want to work with relevant NGOs in helping their beneficiaries. Food is a short-term solution, but the group is working towards helping them in other ways. To stop the cycle of poverty, Hope Kuching also makes sure the children get an education, connecting able bodied adults to employment opportunities. They also enlist counsellors to talk to some of their beneficiaries about family problems. Recently, Wan led a group of volunteers to visit Bilun Mandoh and his family in a kampung in Siburan. Bilun is married with three children, two of whom are still school-going. Unfortunately, Bilun is unable to work after he was diagnosed with stomach cancer in June last year. His wife had to stay home to look after him and their children. Their monthly financial assistance from the Welfare Department of RM200 is not sufficient to pay for their household expenses and rent. 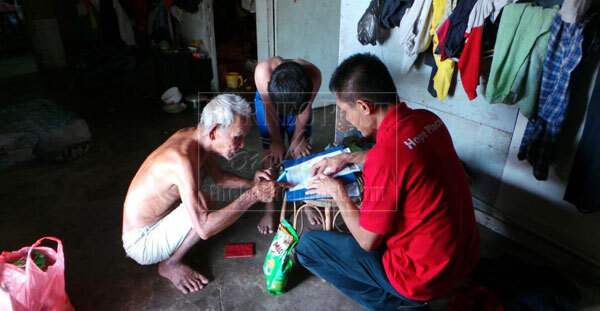 Another recipient is Bong Kok Chin, a frail 89-year-old man living in a tiny wooden house in Chawan Road together with his son and a 10-year-old grandson. They presently survive on the income of his son but even that is not enough to support the three of them. During the visit by Wan and his team, Bong expressed his gratitude for helping them. Among the items delivered to this family were rice, cooking oil, biscuits, instant noodles and canned food. The public is welcomed to contribute food items like rice, canned food, milk powder, cooking oil, child diapers, biscuits, salt and sugar. For more information on how you can help, Hope Place can be reached at (013-5672775) from 8.30am – 12.30pm, Mondays to Fridays.